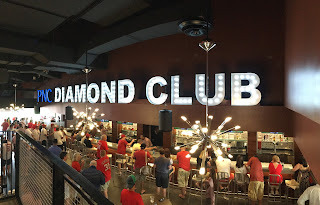 While at the baseball game a couple of weeks ago, we had Diamond Club tickets I was not disappointed in the food, but I was disappointed in the ambiance and service. The staff was friendly but overworked. Table service for drinks was spotty at best. The overall decor was not what you would expect for a premium area - plastic seats and plain, cheap, square tables. It in no way compares to the Texas Rangers' Capital One Club.